Anfavea, Brazil’s auto industry trade group, has predicted that personal car sales will increase 68 percent, from 3.4 million units in 2011 to 5.7 million by 2016. One of the barriers Brazil has faced when attempting to transition to cleaner vehicles is the lack of incentives for newer technologies. Indeed, while there are a plethora of alternatives to gasoline vehicles available—including electric vehicles produced entirely within Brazil to imported, new technology—they remain largely remain expensive and inaccessible in Brazil. Two recent initiatives, however, are working to decrease the cost of newer vehicles and increase the numbers of vehicles running on electricity. 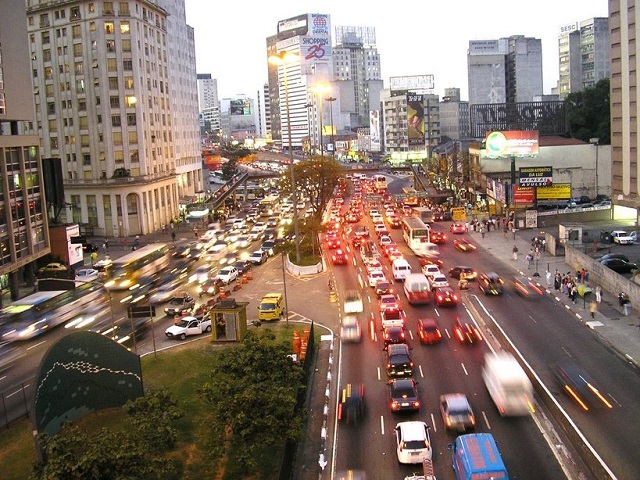 Like any piece of legislation, the bills face administrative scrutiny, but show promise both of becoming law and supporting a cleaner vehicle fleet in Brazil. Last week (October 22), the Commission for the Environment, Consumer Protection and Monitoring of the Federal Senate approved Senate Bill 174/2014, which exempts electric vehicles and vehicles which run on at least 30 percent biodiesel that are manufactured in Brazil from IPI (a tax on industrialized products). Furthermore, the bill lifts the import tax on these manufacturers when purchasing parts (such as electric batteries) that have no domestic equivalent. In effect, Senate Bill 174/2014 seeks to reduce the cost of producing electric and “greener” vehicles, which also would drive down prices for consumers. Moving forward, the bill will be reviewed by Brazil’s Senate Committee on Economic Affairs, where it will either be approved, rejected or modified. If passed, it goes on to the House of Representatives to be sanctioned or vetoed by the president. Two days after the approval of the Senate Bill, the Executive Committee of Foreign Trade Chamber Management announced some good news for anyone interested in electric vehicles in Brazil. Broadening the impact of the Senate Bill, the Committee adopted a draft of a resolution that allows electric vehicles to be exempt from some import fees. Indeed, in the proposal, electric or fuel cell vehicles will be taxed at a lower rate than the current 35 percent. The new tax rate is up for negotiation and will be determined in further revisions of the resolution but it looks like it will be lowering the import cost. Unlike the Senate Bill, this resolution only needs the signature of the Minister Armando Monteiro (Industry, Development, and Trade Secretary) to become law. Transport is the fastest growing greenhouse gas (GHG) emitter of any sector across the globe. Further, within Brazil, transport remains the highest energy-related GHG emitter, contributing more emissions than the industrial and residential sectors combined. Electric vehicles—particularly since over 80 percent of Brazil’s electricity is renewable—may offer a viable way to decrease CO2 emissions in Brazil, but will more importantly boost public health in cities. The local reduction in air pollutants is particularly key as tailpipe emissions are reduced to zero for both battery electric vehicles and fuel cell electric vehicles. These legislative changes are poised to make significant changes in the Brazilian electric vehicle market, and, if approved, may influence individuals looking to purchase new vehicles to invest in more sustainable automobiles. Further, Brazil’s investment into cleaner vehicles should be applied to public transport fleets; cities have a diverse range of strategies available to them for greening bus fleets, and can look to Europe for some inspiration. For example, some cities, like Gothenburg, Sweden, are successfully rolling out electric bus fleets to decrease emissions and local pollutants. And given the rise of BRT in Brazil, electric buses could be a big way for the country to improve outdated bus fleets and drive down GHG emissions. Transitioning to more sustainable vehicles in Brazil will not be an easy process; however, initiatives like the new Senate Bill and Commission resolution incentivize more research into clean technology and encourage individuals to invest in cleaner vehicles. It may not be a revolution in mobility, but these new pieces of legislation are a place to start, and Brazil could benefit even more by focusing on increased technology for its public transport fleet.